Being the textbook Nairobian I am, I am headed for shagz this Christmas. It is that time of the year again when all of Nairobi moves to shagz. In ridiculous fares and bad roads, in empty pockets and heavy rains, in all that nature will throw our way, to shagz we must go. I intend to be a good boy and stay away from the internet, and effectively therefore this page. Not that its hard. See, in our shagz, there is only the Post Office that has something you would say resembles internet. The fares will make sure am bankrupt but thank God they reintroduced flights to my nearest town, I could be grabbing one of those, if they arent all packed that is. My Christmas in the village will be the subject when we resume. Have a great one.Dont let that Mahinda guy from Ruaraka get to you. Peace. 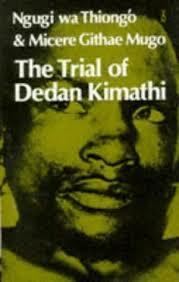 However, 76-year old Kimathi’s widow, Mrs Mukami Kimathi, decried lack of compensation from the Government for freedom fighters, saying she and her children lived a poor life. “Our land was take from us and the Government is yet to acknowledge our selfless acts to our beloved country in the struggle for independence,” Mukami said. See, the government is putting up the impressive statue at the princely sum of Sh 7m. Just remembering them on public holidays and taking them to stadia in government vehicles is not too much service isnt it? For example, the Sh 7m instead of building a statue to Dedan(which is a good idea by the way, only the wrong time) how about his family? His remains are still imprisoned at Kamiti Maximum Prison, and we are talking about some of our greatest heroes. Anyone remember the Ethiopian General Mathenge? Just thought I’d remind you. I am very concerned and it has everthing to do with what you have probably seen already. Everyone seems intent to swing me a million shillings. It is even more the serious because much as I would do with the said million, I didnt ask any of these people offering! See, it has been said all over the place that we live in a materialistic society but no one time is this proved more than at Christmas ironically. The idea that this is a period when giving should be top on the agenda has been overstated and I will not bother with it here. I just want to know why marketers insist that I must buy their products and stand a chance to ‘lose’ a million and my credit. Of late, say in the last week alone, I have counted at least seven that are sure that I need their money badly, for some reason I cant just understand. See, if I have brand lloyalty to your product, I will buy it whether you promise me a car or fifty of them. It all depends on what advertisers call ‘share of love.’ Somebody please tell all those marketing novices that no amount of persuasion will convince me to buy your damn product. AM outta here for now, more coming soon. Holla!